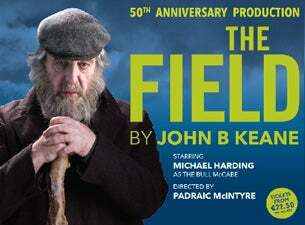 The 50th Anniversary production of The Field currently running at the Gaiety Theatre must end 30th May. Written by John B Keane, The Field is a compelling and masterful piece of writing. This 2015 production marks the 50th anniversary of the first staging of this seminal work. Michael Harding (winner Best Theatre Performer Dublin Fringe 2003) in one of the greatest roles in the Irish Theatre canon - The Bull McCabe. Directed by Padraic McIntyre (The Beauty Queen of Leenane, The Tinker’s Curse, Conversations on a Homecoming – Livin’ Dred Theatre Company) the creative team includes Liam Doona (Borstal Boy) Set Designer; Kate Moylan, Costume Designer and Eamon Fox, Lighting Designer. Presented by Pat Moylan, Donal Shiels and Breda Cashe in association with MCD. The Field continues today to strike a chord with audiences throughout the world. The story burrows deep into the heart of rural Ireland in the late 1950s; at its core is the enduring link between the Irish people and ‘the land’. The play is based on the true story of the 1959 murder of Moss Moore, a bachelor farmer in Co. Kerry. Moore's neighbour, Dan Foley, with whom he had a long standing dispute over a right of way, was believed to have committed the murder. Foley’s family denied the charge and no one was ever brought to justice. John B Keane was born in Listowel, Co Kerry in 1928. He published forty-six works, but is best known for his plays which include Sive, Sharon’s Grave, The Man from Clare, The Year of The Hiker, The Field, Many Young Men of Twenty, Big Maggie, Moll, The Crazy Wall, The Buds of Ballybunion, The Chastitute and Faoiseamh. His novels are The Bodhran Makers, Durango, The Contractors, A High Meadow. He has published many books of humorous essays and letters including Letters of a TD, Love Bites, and Owl Sandwiches. He has published one book in Irish, Dan Pheadí Aíndí. His biography is Man of The Triple Name. He died in 2002 aged 73 years.